Diego Costa has withdrawn from Spain's squad for Uefa Nations League games against England and Croatia over "personal reasons", the Spanish Football Federation says. 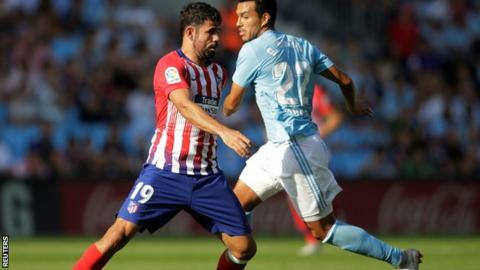 Atletico Madrid's 29-year-old former Chelsea striker will be replaced by Celta Vigo forward Iago Aspas, 31. Spain face England at Wembley in Group A4 of the new tournament on Saturday, their first match under Luis Enrique. The ex-Barcelona boss named his first squad since taking charge on Friday. He left out Barca left-back Jordi Alba and Atletico midfielder Koke, while Andres Iniesta, David Silva and Gerard Pique have all retired from playing for Spain since this summer's World Cup last-16 exit under Fernando Hierro. Four Chelsea players are in the squad - Marcos Alonso, Alvaro Morata, Cesar Azpilicueta and Kepa Arrizabalaga. Real Betis goalkeeper Pau Lopez, Valencia full-back Jose Gaya and Real Madrid midfielder Dani Ceballos are all in contention for international debuts.